Efficient and timely communication is an imperative for the success of any movement. SMS played a critical role in mobilizing masses in the Anna movement. 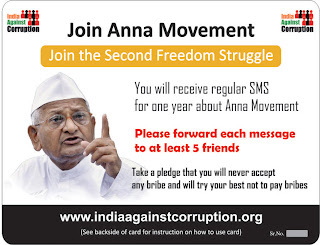 Therefore the India Against Corruption movement has launched an Anna SMS Card. 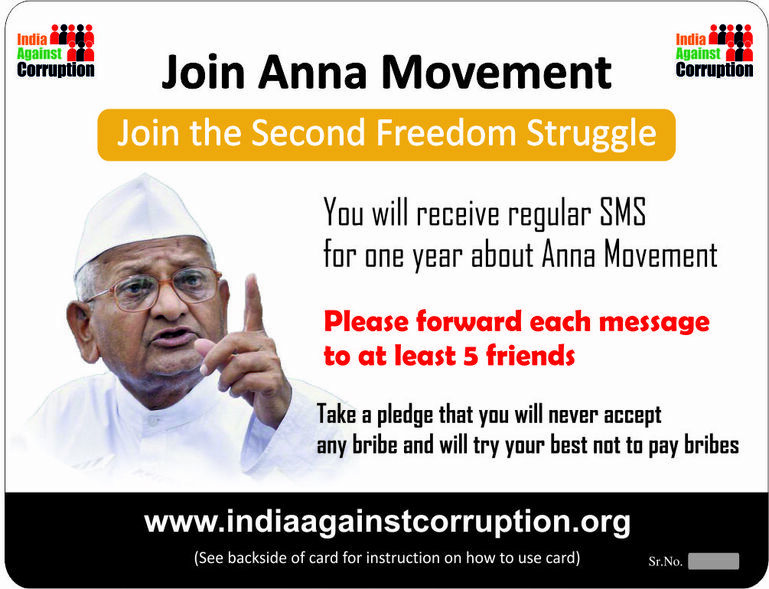 Every person who becomes a part of the India Against Corruption movement by contributing/ donating a minimum amount of Rs.25 will be given the Anna SMS Card. By this card people connected with the movement will receive regular messages (about 3-4 messages per week) for the next 1 year. These SMS updates will help all of us stay connected with the movement. Please read the details given below carefully before you make the payment. 1. When you subscribe Anna SMS Card online, instead of getting physical cards to scratch it and send, you will receive the SMS Card code directly delivered to your Email Inbox. 2. You can contribute/donate for more than 1 Anna SMS Cards (codes) and for each contribution of Rs 25/- you will get 1 SMS Card Code via Email. 3. SMS the Card Code to 09223334545, and start receiving regular messages (3-4 message per week). One Anna SMS Card Code must be used with One mobile number. 4. You will receive SMS for the next 1 year from Anna Movement with each subscription. 5. By default SMS Language is English. 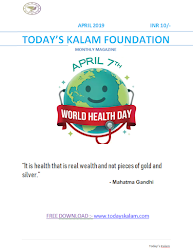 It can be changed by sending HINDI to 09223334545. 6. For any issue related to Anna SMS Card Code, call on our helpline number 022 - 39845371 between 9:30am to 6:30pm (Monday-Saturday). 7. 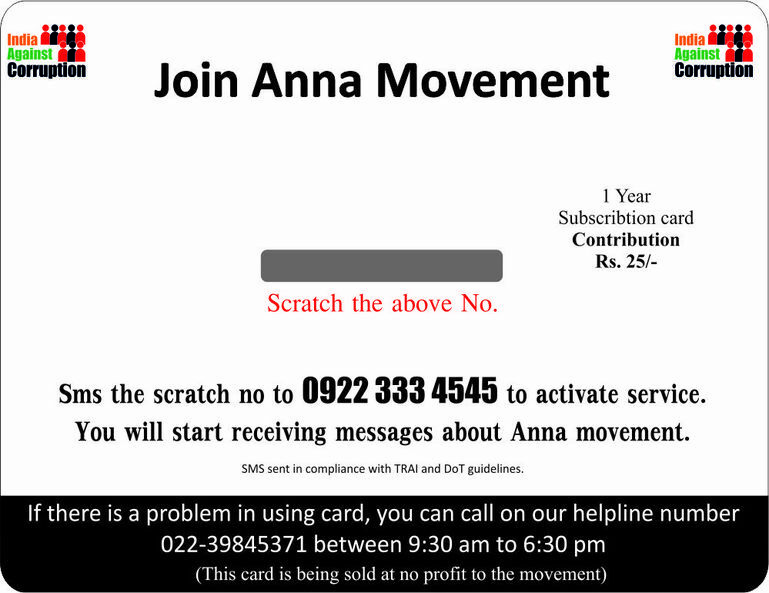 This Anna SMS Card code is being distributed at no profit to the organization. 9. 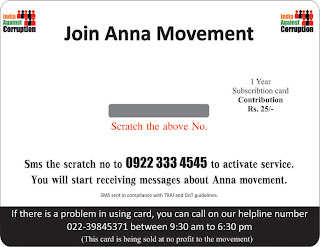 Anna SMS Card code(s) is valid in India only. 10. If you face any issue during online purchase, please write an email to annacard.2012@gmail.com. Note: Online distribution of Anna SMS Card Codes is available ONLY for India residents, and valid for Indian Debit/Credit Cards/Net Banking. NO INTERNATIONAL TRANSACTIONS. For more Information You Can Visit Here.. Anna SMS Card..